Hello everyone, what’s up? How are you surviving this heat? I fell sick so many times while I was out in the daytime. Please drink lots of fluid and stay hydrated. 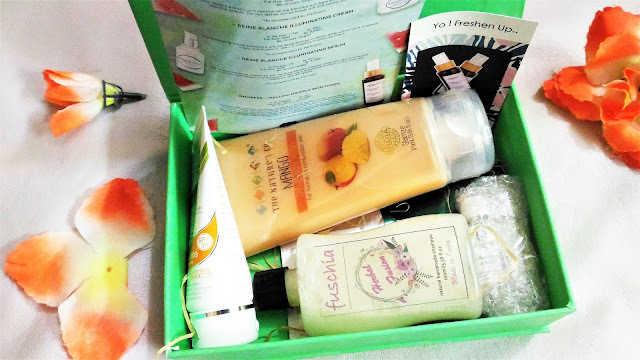 Okay, today I’m going to review My Envy Box May 2017 edition. The box’s theme this month is ‘Slip of Summer’. So without further ado let’s just get into it. 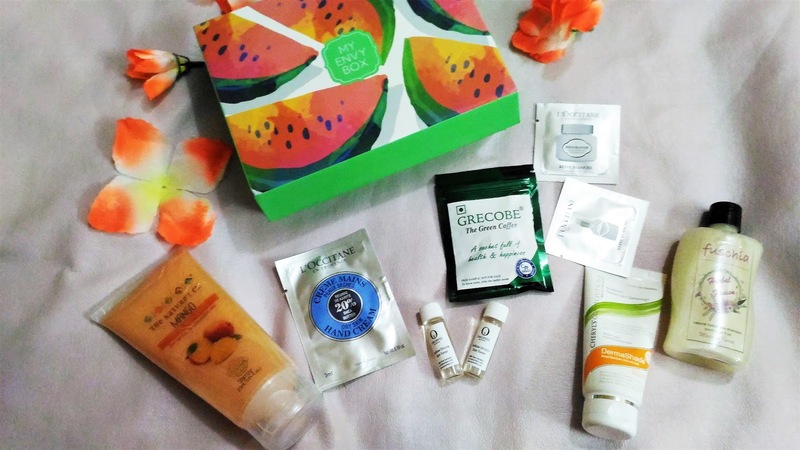 About My Envy Box: My Envy Box is basically a subscription box which comes with samples from luxurious brands. 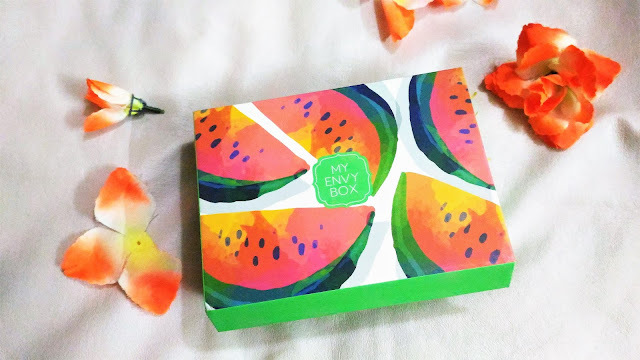 My Envy Box is based out of New Delhi and launched their services in August, 2013. The Envy Box: Each month subscriber will get a box of samples of leading beauty products. Packaging: The product came in a moisture retentive pack inside which there was a white cardboard box. Inside the white cardboard lay My Envy Box. 1. 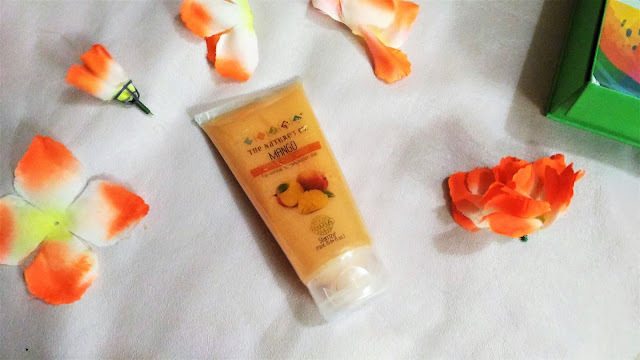 The Nature’s Co- Mango Crème Body Wash: This looks way too tempting and yummy. I’ve already tried this and loved it. It smells like fresh mango. There’s a 175ml tube in the box which retails for 695/- and the full size 250ml retails for 995/-. 2. 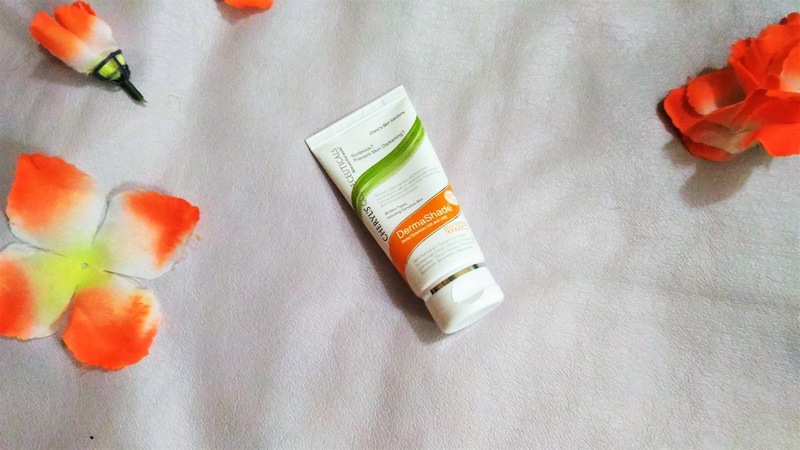 Cheryl’s-Dermashade Sunblock Spf 30: We all know how important it is to apply sunscreen throughout the year. This one is a limited edition as mentioned in the box and exclusively available in salons. This one’s a full sized product and retails for 550/-. 3. 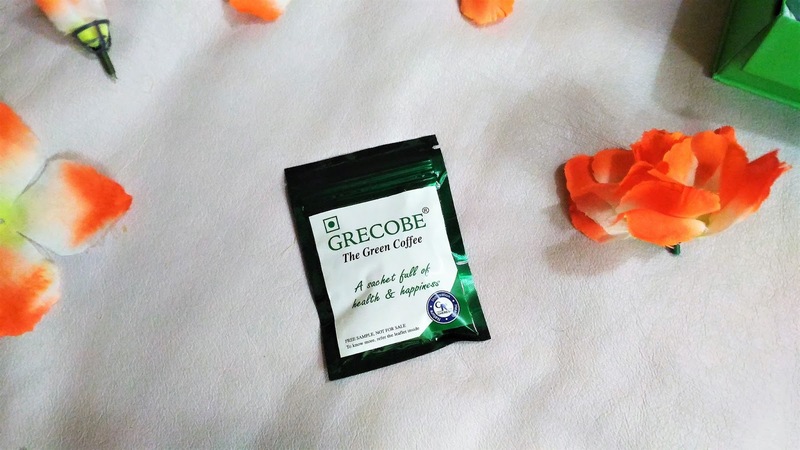 Grecobe-Green Coffee: I’ve never ever tried green coffee and have no idea what it tastes like. So, green coffee beans are unroasted and decaffeinated which is healthy but being a fan of caffeine I don’t know how it will be to me. It is great to reduce blood sugar levels and also been implicated in weight loss. It is also anti-diabetic. There’s 5 sachets in a zip lock pouch which has been provided in the box and the full sized product has 30 sachets worth 540/-. 4. 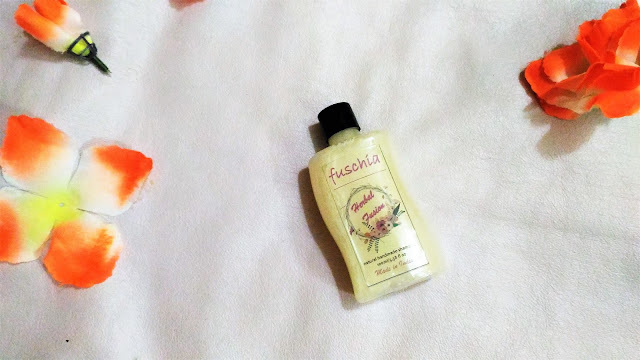 Fuschia- Herbal Fusion Shampoo: It’s a herbal shampoo combined with 9 herbs and it suits all hair types. There’s a full sized bottle in the box worth 450/-. 5. L’occitane Shea Butter Hand Cream: There’s a 3 ml sachet in the box and the full sized retails 30ml retails for 720/-. 6. 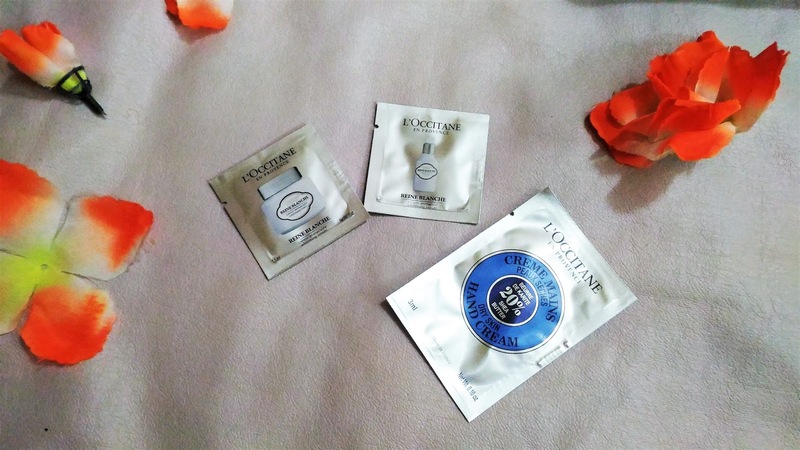 L’occitane Reine Balanche Illuminating Cream and serum: There’s 1.5 ml sachets of each in the box and the full sized products (50 ml) retail for 4,590/-. It also says ‘whitening’ on it so I’m never going to try this. Endorsing whitening and fairness products is a big no for me. 7. 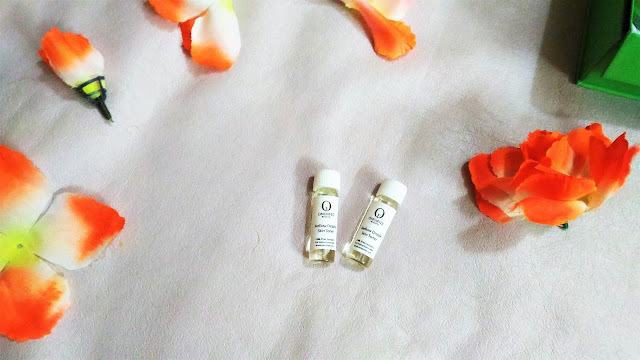 Omorfree- Mellow Drizzle Skin Toner: We get two small sample glass vials of this (4ml each) and the full sized 100ml retails f or 799/-. So, these are all I got in My Envy Box May 2017 editon. It was good except for the sachets. Seriously, people just stop providing these sachets. It is of no use. There’s hardly any product in there. Previously the boxes provided atleast one makeup product every month and now it’s every alternate month. Other than these the box was cool. I would rate this box 3/5. I don’t know whether to recommend it to you a 100% but if you want you can give this a shot. Stay cool.